The courtyard here is our living room: we have three rooms and a kitchen, but the place to sit, relax, and eat is usually outside. (At least while the good weather lasts!) We got a lot of use out of our plastic camping chairs, but eventually we wanted something more comfortable. 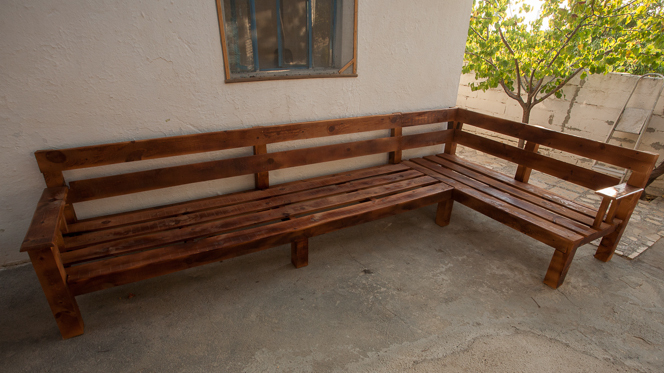 So we decided to build a sedir: a kind of low, long, wooden Turkish sofa. 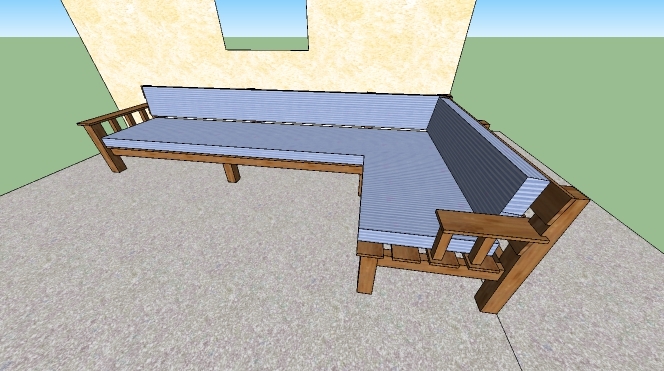 We put our ideas into Sketchup and then bought some wood. The original plan in Sketchup. 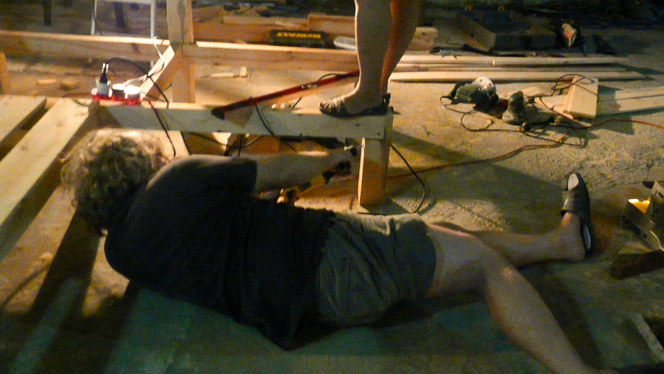 Jason testing the strength of the wooden beams. No middle support yet. The second part of the “L” taking shape. 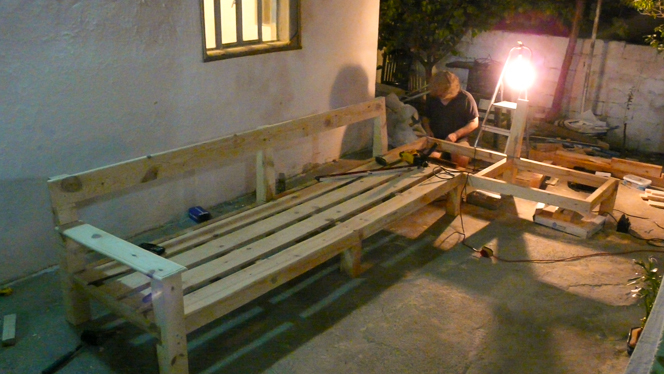 Working into the night: Jason was determined to finish it before dawn. Luckily we have tolerant neighbours. 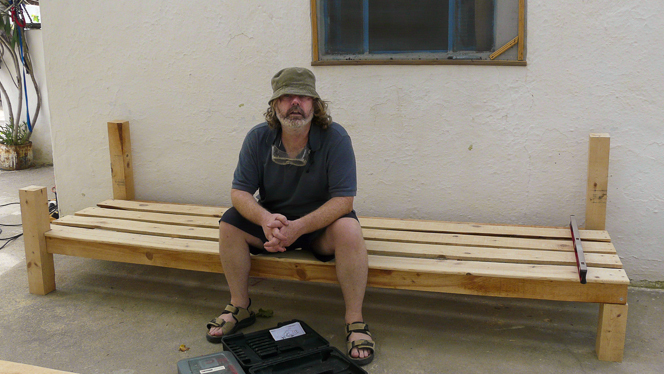 That is me with the important job of putting some weight on the corner. 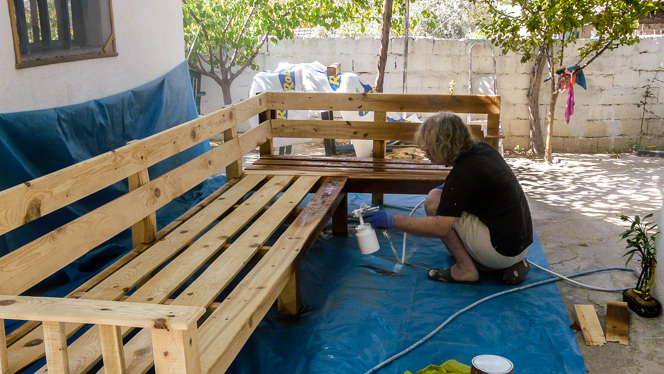 After a late night finishing the construction, we sanded everything down and used our new compressed-air spray gun to stain the sofa. 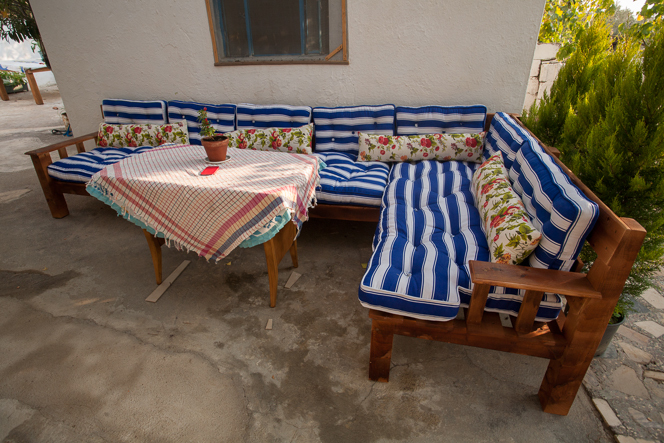 I bought some blue and white fabric, and found a local tailor who specializes in cotton-filled cushions and duvets. 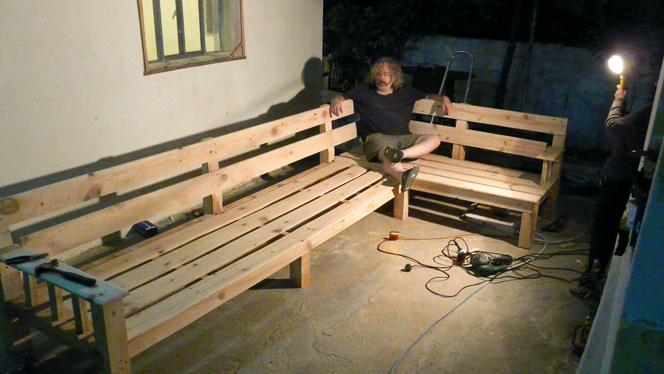 He put together some very nice fat stuffed cushions within a few days. Spray gun time. Jason says everyone should own an air compressor. I am not sure whether I agree with him. Cushions arrived. It is as comfy as it looks. We also felt bad that our dog Zeytin was still living in a cardboard box as winter approaches. 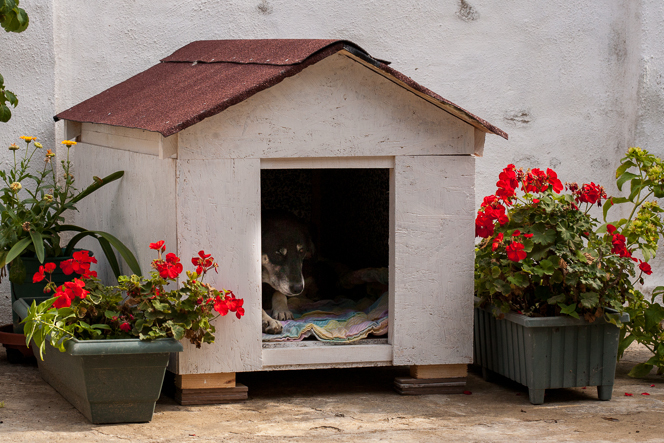 So we knocked together a little dog house for her. She is again pleased with her new accommodation. 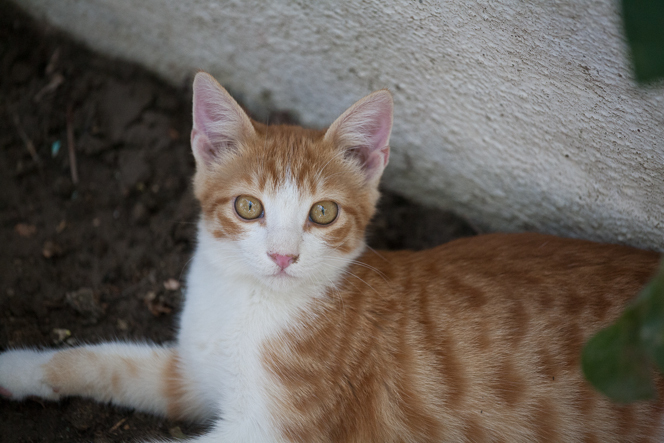 Finally, you are never very far from animal-related drama in a small village in Turkey. 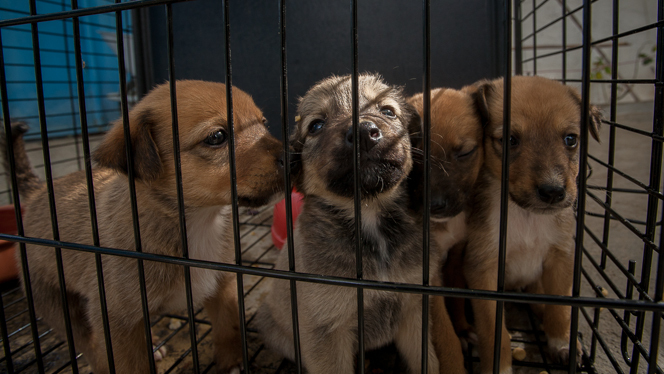 The other day we came home to find four beautiful puppies had been abandoned on the road near our house. 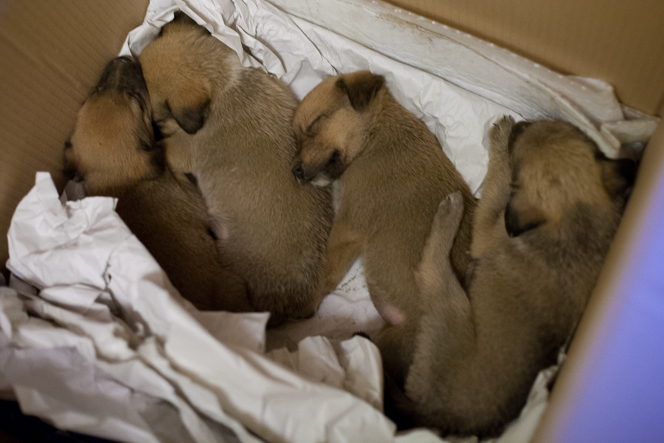 We had to do something for them: I think the pictures show how impossible it would have been to leave them out in the street. It was a long night of feeding them milk and cleaning up their pee and cuddling them. So much cuteness in one box. Unfortunately we just couldn’t keep them because we already have five cats and a dog. So we made some phone calls to animal charities in the area, and luckily we found there’s an excellent dog shelter in Aydın run by the local council. They assured us that all four puppies would have no problem finding a new home, so that made us feel a bit better about the sad moment of having to part with them. OK, where are we going? Is there food there? 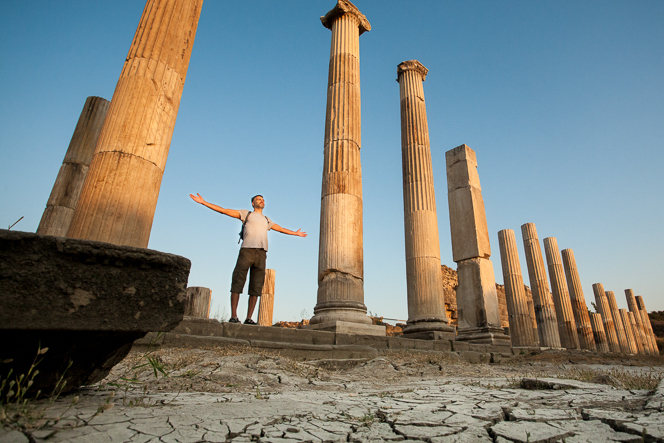 The ancient city of Ephesus is around 3000 years old and around 30 minutes drive from our place. It’s by far the biggest tourist attraction in this part of Turkey. I read somewhere that it’s the third most visited site in all of Turkey, after Istanbul’s Hagia Sophia and Topkapı Palace. 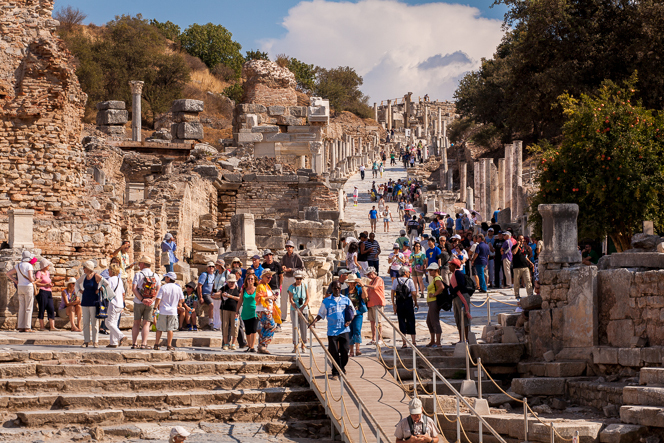 With all those visitors, it does tend to get a little crowded; especially in summer when there are multiple cruise ships per day docking at nearby Kuşadası, disgorging Ephesus-bound passengers by the coach-load. Still, all those people visit for a reason: it’s utterly spectacular. It’s also, I think, one of the best places to get a sense of what everyday life might have been like in the ancient world. 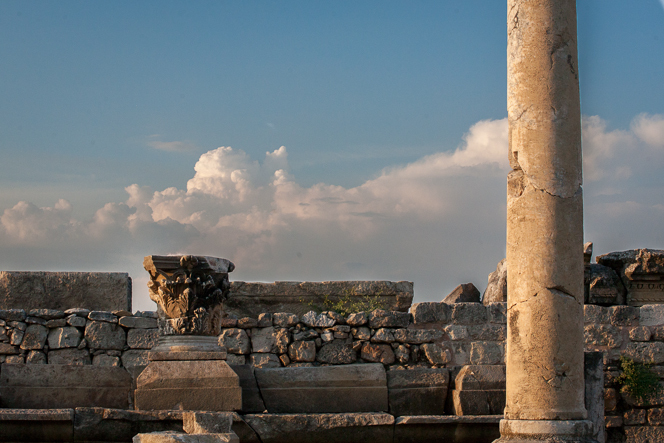 So if you come and visit us, assume that we’re going to devote at least a day to Ephesus. 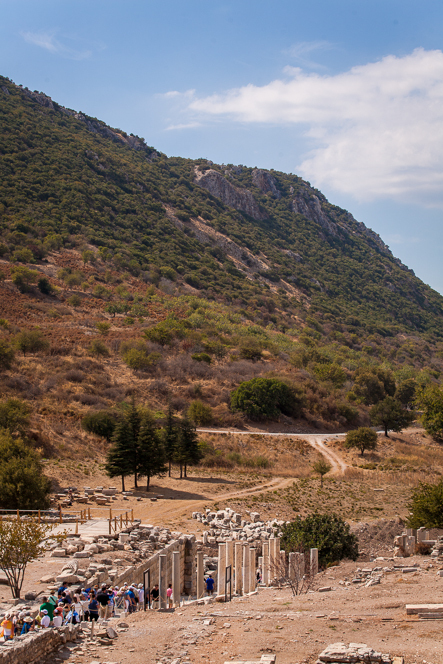 Ephesus is surrounded by dry Mediterranean hills. This hill would once have looked out over the city’s harbour, before it silted up. It’s a big site, and it can be hot, so it’s important to bring some water. There is, however, no shortage of shops willing to sell you freshly-squeezed pomegranate juice (or pretty much anything else) at either exit. 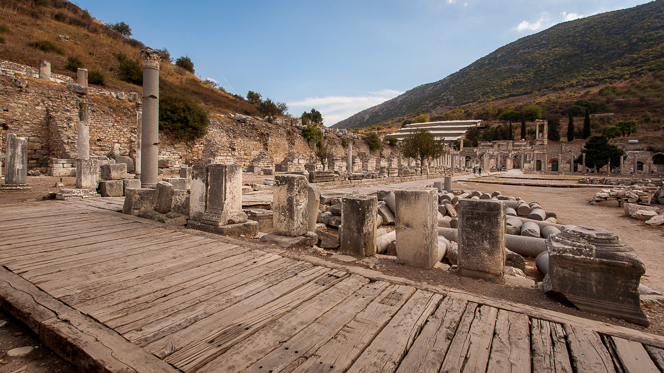 The view down Curetes Street: the ruins of baths, shops, private houses, temples, etc. Like most of the tourists, we started at the upper entrance and worked our way through town. It’s quite a walk: about two kilometres. In some places you’re looking at tumbled stones with an archaeological sketch suggesting what once was, and in other places there have been painstaking excavations and reconstructions. 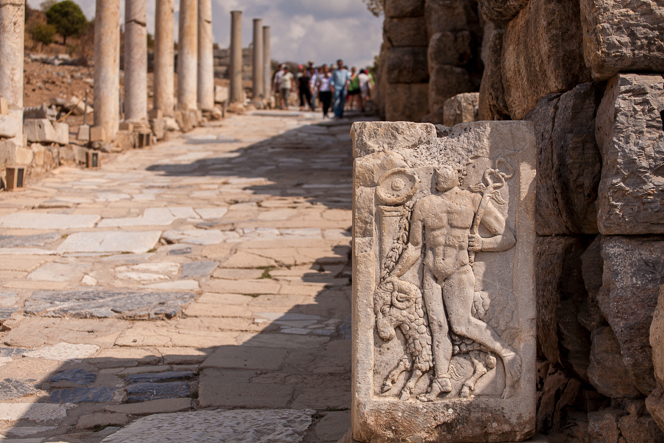 You get to see both the big, spectacular stuff — the theatre, temples, the famous library, two different agoras — but also smaller things like houses and even the remains of a public bathroom. For me, the smaller-scale buildings made it easier to imagine what life might have been like here. There’s also impressive tile-work and sculpture all over the place. 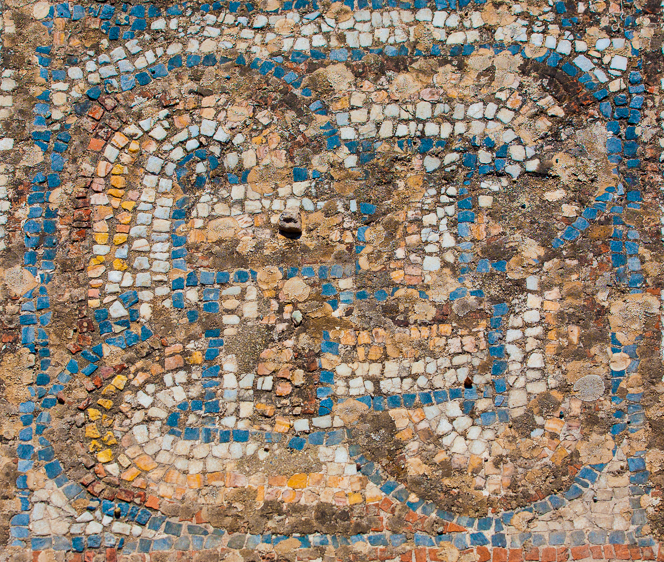 Colourful mosaic tiles. I don’t know for sure, but I think this might have been the porch of someone’s house. Stone arch: look at the detail! 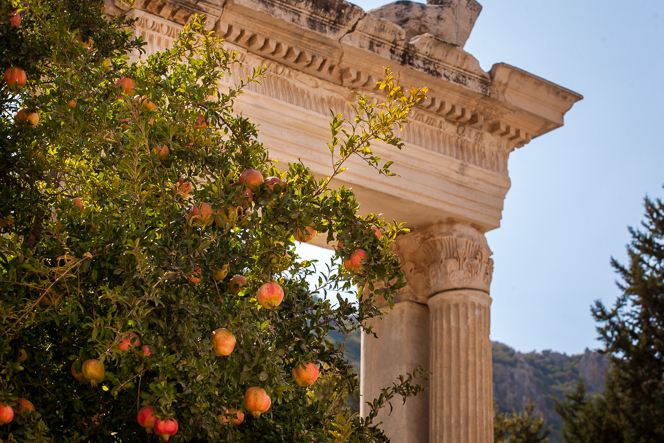 Pomegranate trees among the ruins. I’d like to think the tree is descended from the original Ephesian orchards. 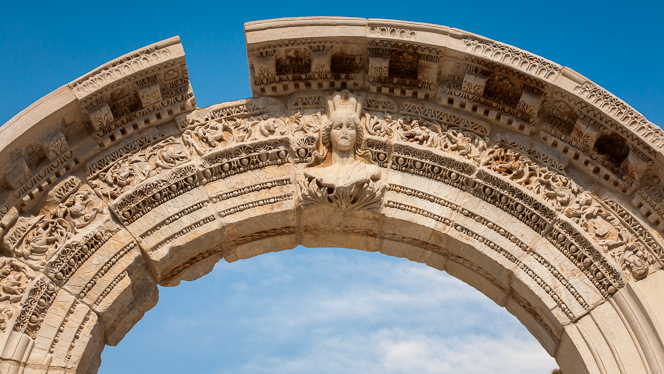 The library of Celsus is Ephesus’s most famous landmark. Being a photographer who embraces cliché, of course I had to get a picture of it. 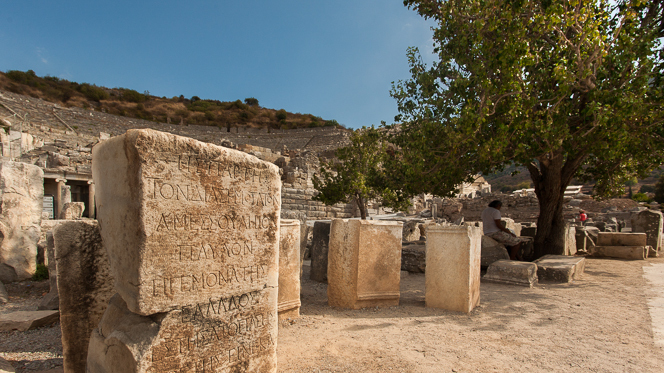 Ephesus was founded around 1000 BC by the Ionians (Greek colonists) but the library dates from the much later Roman period, around 100 AD. You can imagine that the original building was very imposing. The reconstructed facade of the library of Celsus. 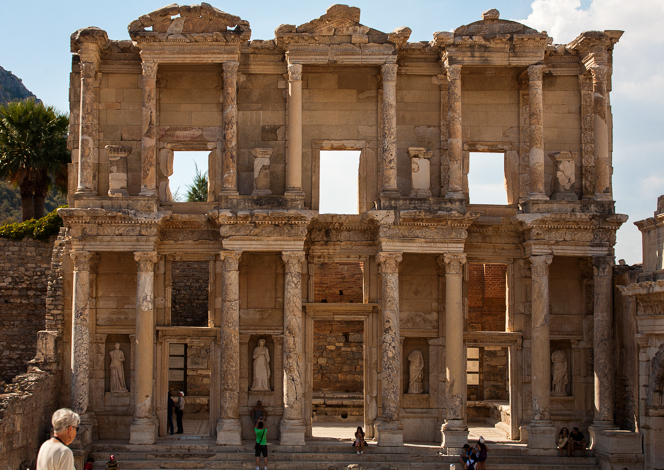 When I first saw the library, on a previous trip to Turkey years ago, I thought that the builders must have done very well given that it was still standing so many centuries later. And in an earthquake zone, too! The truth is more complicated: the library did indeed fall down in an earthquake in 262 AD. Only the facade remained, but that collapsed too in a later quake. The columns and sculptures of the facade are so well preserved because they were buried for many years, before a faithful reconstruction was carried out during the 1960s and 1970s. Looking back up Curetes Street. More people than Magnesia, that’s for sure. The larger of the two agoras, close to the old harbour. Stone pillar with inscriptions; 25,000 seat theatre in the background. 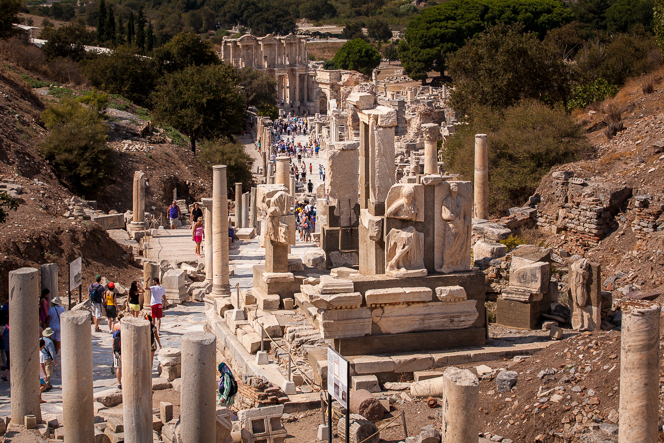 That was our day at Ephesus. Afterwards we took our visitors for dinner and a swim at Pamucak beach, which is just down the road. 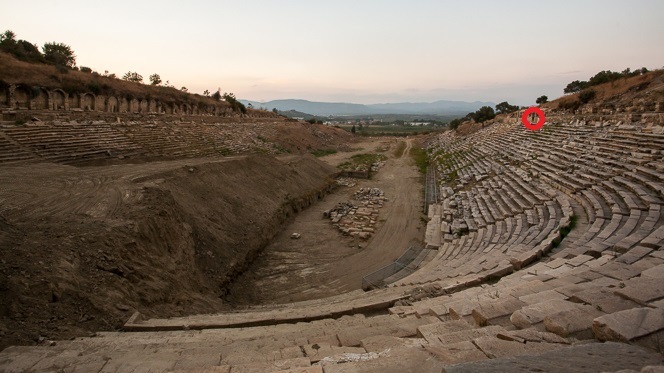 (The Küçük Menderes river used to flow into Ephesus’s harbour, but after centuries of silt deposits it now reaches the sea five kilometres away at Pamucak.) History followed by a beer on the beach seems a good day out to me. We’re still feeling pretty low after the events of last week — and thanks, everyone, for all the support. Fortunately, I guess, we have a backlog of earlier activities to talk about. In mid-September we went back with our visiting friends Berkan and Sofie. I was struck again by how the road and the railway line cut right through the old city walls, making for strange pairings of ancient and modern. 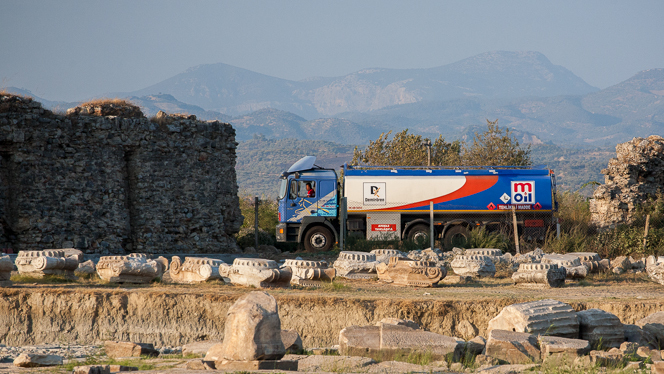 Truck driving through ancient Magnesia. The stone is at its best as the sun sets. Don’t blame Berkan for this: I asked him to pose like that. Forgive the cheesiness, but in the three photos below I’ve circled the human figures in red. It was the only way I could think of to get across some sense of scale. Taken from up on the western side of the stadium. 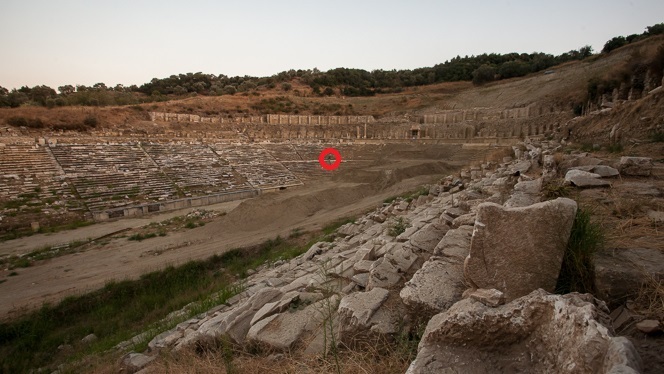 That’s Sirem sitting inside the red circle. Parts of the stadium are still buried; that huge ramp of dirt is what remains for the archaeologists to dig out. The open end of the stadium looks out to the north, across cotton fields and towns to the hills beyond. 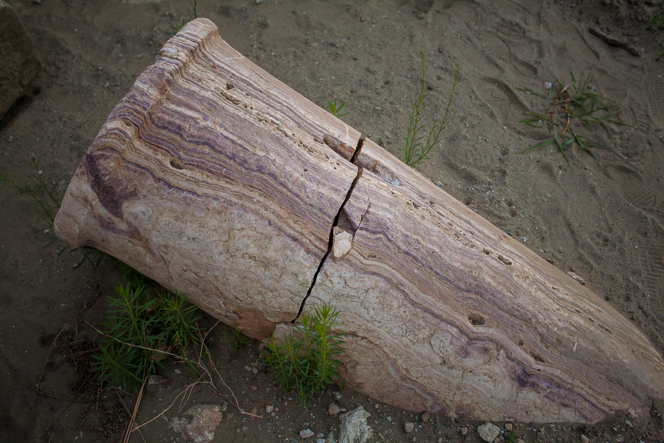 Half-buried column showing the fantastic colours in the stone. 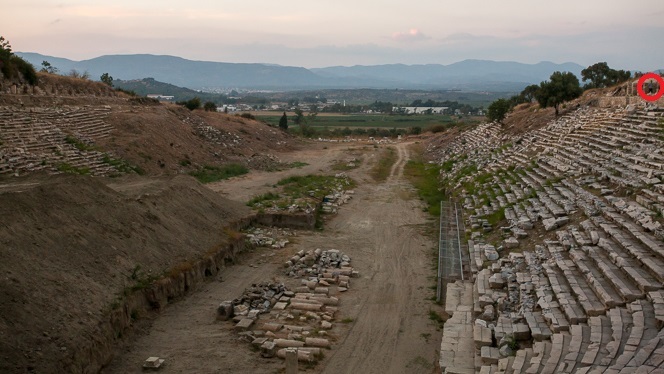 So, Magnesia is even more amazing than we thought, and we’re lucky to live so close to it. We spent nearly an hour wandering around the stadium, and the four of us were the only people there the whole time. I think that shows just how rich Turkey is in archaeological treasures: if this sort of structure was in most other countries, there’d be a crowd and a queue to get in. The theatre was not quite on the same monumental scale, but was very beautiful, and also totally devoid of people. Unfortunately it was dark by the time we got there, so no photos yet. But that just gives us an excuse for another visit. We had an awful day today. We lost Tarçın. He started choking on a piece of chicken — we got it out, eventually, but I think we were about 30 seconds too late to save him. We feel hollow and empty right now. He was a great little guy. We miss him terribly. Summer is winding down. Today’s high temperature was 28 degrees. Right now, at about 1am, it’s 18 degrees outside. Still very pleasant, but it’s getting too cold to spend the whole evening out in the courtyard. In the next month or two we’re going to lose the last of the leaves on our grape vines and fig trees. That will be a sad day. By the time January comes around I suppose we’ll also find out how good adobe-brick walls are at keeping out the cold. Back in July and August we had daily highs between 35 and 40, and clouds were a rare sight. The locals use all that sunshine to dry fruits and vegetables. 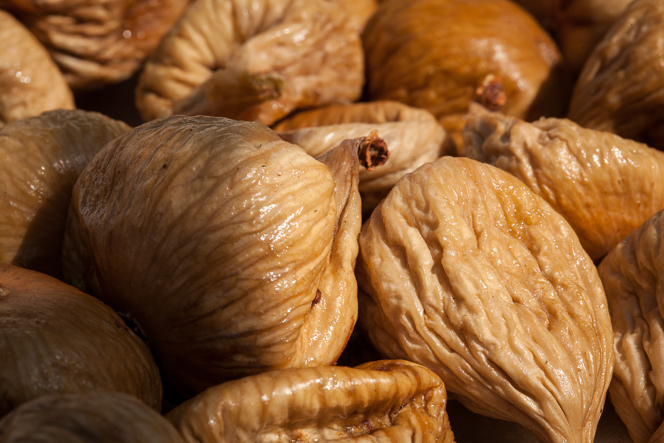 No cooking, no additives — except sometimes salt. Just leave it out in the sun for a few days. 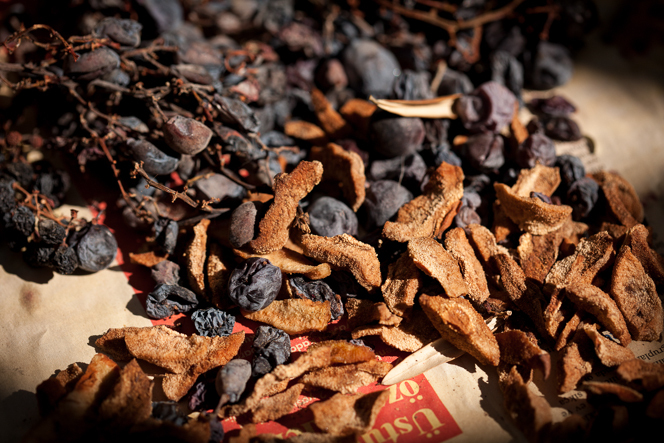 We sun-dried our figs, but we also tried it with other things, like grapes, pears, and peppers. Some experiments were more successful than others, but at least we have a few things stored away for winter. Regular readers of the blog will already have heard plenty about our fig-growing efforts, but I’m still going to show you another fig photo because we love them. OK, just this one and no more fig shots, I promise. 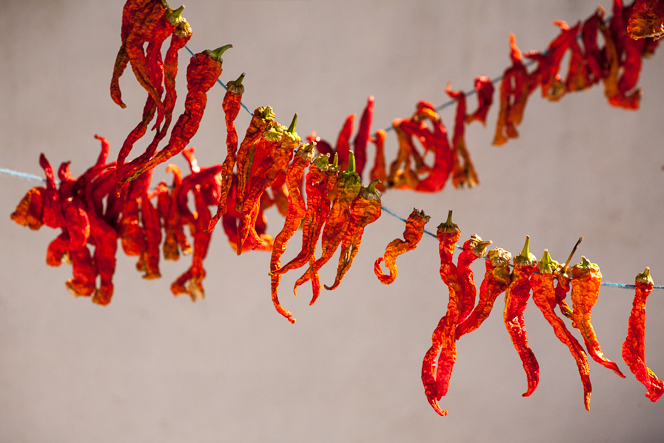 Peppers threaded onto string, drying in the courtyard. 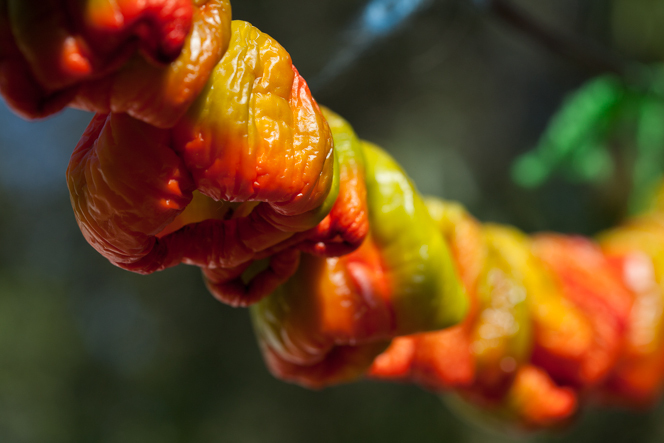 Green peppers turn red as they dry. Who knew? Drying grapes and slices of pear. This didn’t really work out, but they look cool together. 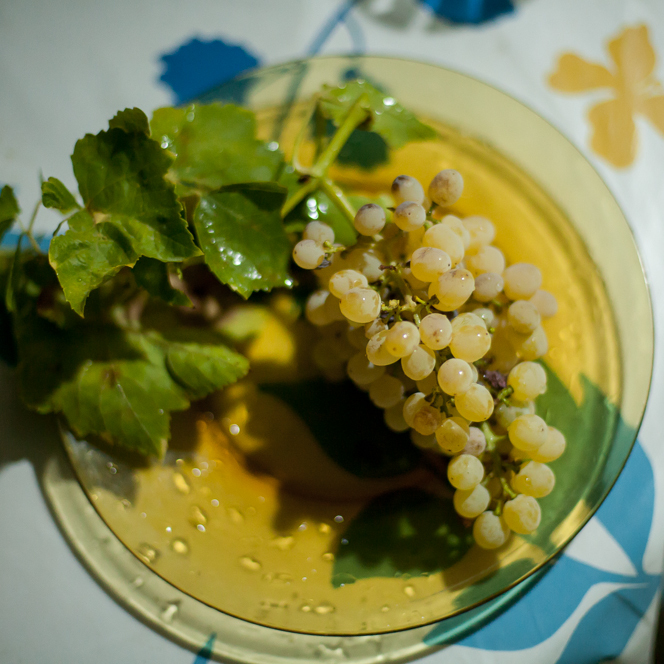 Our grapes were much better fresh. What else can I tell you? In fact I’m behind on posting and there’s a lot to talk about. 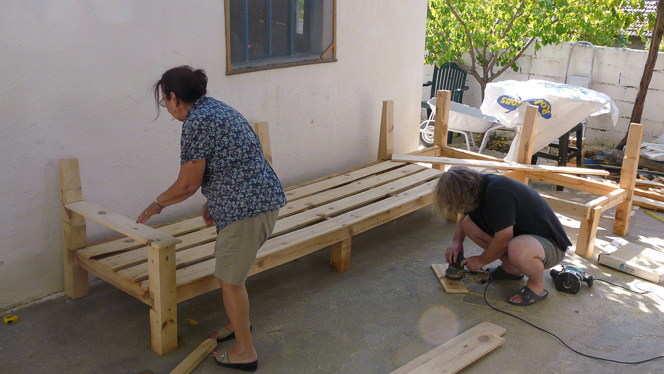 We’ve had visitors, we’ve been out to see a few more of the fantastic archaeological sites in the area, and we’ve been busy building a sedir (low outdoor sofa) for the courtyard. But those things deserve their own posts. I should say, though, that our cat Molly is doing much better lately. Thanks for all the good wishes sent her way. I’ll leave you with a photo taken yesterday from a hill on the other side of the village. We used to think it was all private land up there, but we found a dirt road leading to a picnic area at the top of the hill. 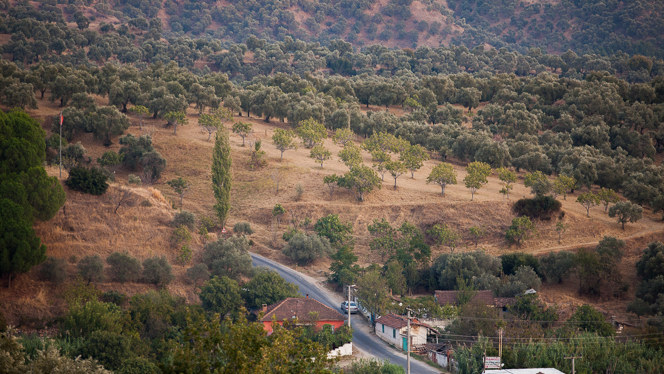 Great views of Hıdırbeyli, Germencik, and the Menderes Valley to the south, but also a great spot to get some perspective on our place. We’re the last house on the right, and that’s the fig orchard up on the hillside. The fig trees are a lighter green than the surrounding olives. Farmhouse outlined in yellow; orchard outlined in red.